I was surprised at how bereft I was the day after the Mad Men finale, as though I’d said goodbye to my childhood forever. The only thing that made me feel better is the memoir I’m writing; nearly every day lately I return to the 1960s. A few seasons into Mad Men, a couple of friends predicted that Don Draper would commit suicide, given his self-destructive tendencies. Many viewers thought the opening animation of a man in a suit falling from a skyscraper foreshadowed such an ending. I bristled at the judgmental tone I sometimes heard, as if Don deserved such an end, given his many faults. On the contrary, Don was emblematic of a certain kind of self-made man of his time–raised in poverty and neglect, a traumatized war veteran who became a successful ad man, rich beyond his wildest dreams, yet alienated and lonely. Like all humans, he struggles. Like The Man in the Gray Flannel Suit, he’s lost. You can find Don Draper in much of the literature of the 1950s and ’60s. The show’s creator, Matthew Weiner, drew heavily on bestselling books of that era, and was particularly influenced by the short stories of John Cheever, as well as Cheever’s journals. 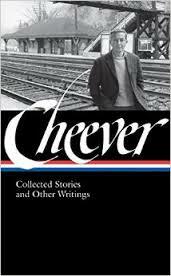 In fact, at the beginning of every season of scriptwriting, Weiner read the introduction to Cheever’s stories to the writers as a source of inspiration. Weiner says that he loved reading the journals of 1950s and 1960s writers and ad executives and found them enormously helpful. While many of us look upon advertising with distaste, or at least ambivalence, Don Draper and his colleagues were in fact supporting families while doing deeply creative work. I think Weiner got it so right as he charted the highs and lows of these highly creative men and women. Weiner also points out that many famous artists have had to do advertising work to make a living. When I was in college, a couple of my male friends had fathers who were prominent ad men, having commuted from the suburbs into Manhattan every day for thirty years. They seemed to feel pressure to follow in their fathers’ footsteps, and I sometimes sensed they were afraid they wouldn’t measure up. Advertising was a difficult, high-pressure career, but also an exciting and fulfilling way to make a living. And, of course, most ad execs were not deeply flawed Don Drapers. One note of nostalgia for me is that the show ends in 1970, and in 1977 I moved to Manhattan, where I worked in book publishing. For a time I was in the advertising department of a large publisher, where I worked with artists, graphic designers, photographers, and other creative people. Publishing was a different world from high-stakes Madison Avenue advertising, of course, a backwater compared to the pressure of Mad Men agencies. But when I saw Mad Men’s meek Peggy Olson show up for her first job in that office in the sky, I was taken right back to my New York City days. Peggy’s world, where women in the workplace were all secretaries, was to a large degree my world. Needless to say, watching Peggy’s transformation has been riveting. 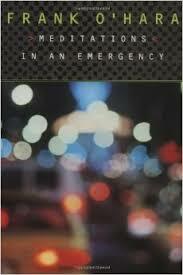 Weiner says Frank O’Hara’s poetry in particular helped him understand the zeitgeist of the times. He read Lunch Poems and Meditations in an Emergency (which we see Don reading in one episode), and says that Meditations changed his life. That makes me curious, so I’ve added O’Hara to my reading list. The last episode concludes with what has been called the most famous commercial of all time: the Coke ad with the song, “I’d Like to Teach the World to Sing.” People critical of this ending feel cynical about pairing this uplifting message, sung in harmony by people of all races, with crass commercialism. As for me, I thought the ending was perfect, in sync with the person Don is, and in sync with the times. Yes, Don Draper the ad man may have risen like the phoenix to create the most popular commercial in history. But I took his encounter with the lonely stranger at Big Sur to be an authentic moment of growth and greater self-awareness. I haven’t been to Esalen, but I’ve been to a place called Spirit Rock, and things like that do happen to people. If Mad Men were to continue, I think Don Draper would still be the flawed man we know, far from perfect. And yet, a better man, too. You can hear Matthew Weiner’s thoughts about Don here in the NYPL interview. 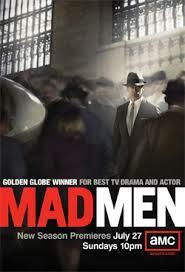 I think Matthew Weiner ranks right up there with the great novelists of our time. If you’d like to meet the real ad man who created the Coke commercial (Bill Backer, who makes clear he has nothing in common with Don Draper), click here. Are you a Mad Men fan and have you watched the ending? What did you think? 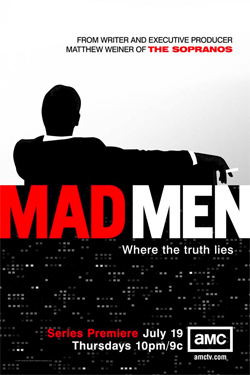 If you’d like, please share your thoughts about any aspects of Mad Men. Fascinating… you gave me a new take on the advertising world, and i love to hear a bit about Esalan…in fact I’d like you to write a whole lot more.!!!.. Thanks, Valerie. I shall have to do a post about my experiences on that subject, along with some excellent books to go with it. Judy and I watched all the seasons of Mad Men. She was more enthusiastic about the show than I was, but I enjoyed it. I thought the last season was disturbing and effective in portraying the sense of unraveling that was a feature of the period. But the last bit with Don’s transformation and the Coke commercial was to me about how capitalism absorbs and transforms virtually all cultural trends. I think capitalism is regarded as the be all and end all. I’m glad DD prevailed but I do think the last bit foreshadowed the extreme capitalism to come. I haven’t seen Madmen yet, so I was careful about spoilers in your post, but I did love seeing the reading lists. Thanks for the links! Thanks, Naomi. I wish I’d known about these lists as I was watching, but I didn’t! When I graduated from high school, ‘girls’ were either teachers, nurses or secretaries. I’m glad that the women of today have no limitations on their career dreams.